America’s love affair with the car is well-documented, but many U.S. adults also rely on a bus, train or subway to get around. One-in-ten Americans (11%) say they take public transportation on a daily or weekly basis, according to a new Pew Research Center survey conducted in late 2015, but who is taking public transit varies substantially by region, nativity, and race and ethnicity. 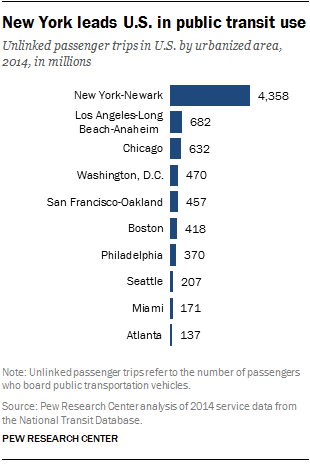 The Northeast, home to several of the most traveled transit systems in the country, has the largest share of adults by region (25%) who use public transportation on a regular basis (daily or weekly). City dwellers are also more frequent users of mass transit. Some 21% of urban residents use public transit on a regular basis, compared with 6% of suburban residents and just 3% of rural residents. Recent headlines on public transit haven’t been flattering. Last week, Washington D.C., transit officials warned that repairs to its subway system – which is one of the most used in the nation – could close entire rail lines for up to six months. This statement came two weeks after the city’s metro rail service was suspended for 29 hours for emergency inspections. The nation’s capital is not the only city facing public transit issues and changes. A 2013 Federal Transit Administration report estimated that “more than 40% of buses and 25% of rail transit around the U.S. are in marginal or poor condition.” Besides infrastructure concerns, other cities are looking for ways to grow ridership, increase affordability and modernize how commuters pay for fares. Americans who are lower-income, black or Hispanic, immigrants or under 50 are especially likely to use public transportation on a regular basis, Pew Research Center data show. While there are few racial and ethnic differences in public transit use among non-urban residents, there are substantial differences when looking at only those living in urban areas. Among urban residents, 34% of blacks and 27% of Hispanics report taking public transit daily or weekly, compared with only 14% of whites. Foreign-born urban residents are more likely than urban dwellers born in the U.S. to regularly use public transportation (38% vs. 18%). One possible reason that blacks, Hispanics and immigrants might be bigger users of public transit is because they are more likely than Americans overall to live in large metropolitan areas, where there tend to be more public transit options. They are also less likely to have access to an automobile than other groups and are more likely to use public transit for commuting to work. Blacks and Hispanics also tend to live farther away from their jobs, which could make walking or biking to work less common.